I remember being shocked to find out that Christopher Columbus and his Crew were not the brave hero's that we were all taught in school, he was in fact a convicted criminal in the prisons of England that the Queen released and ordered to seek out and conquer this fabled new world. Why? He worked for free or was imprisoned for life and no one else wanted to go on such scarey a quest for the Queen. I never got over it. The common education "PROGRAMS" are all like this one in order to educate the masses all in the same way as to History and Reality. This is how reality is designed in this world. To learn some real factual and larger realities, let's meet our famous neighborhood physicist, Michio Kaku and ask him some important reality questions. After listening to this genius at the top of his class in the science world, what else is really going on? At the least, an enjoyable listen. And saving the Best for Last . 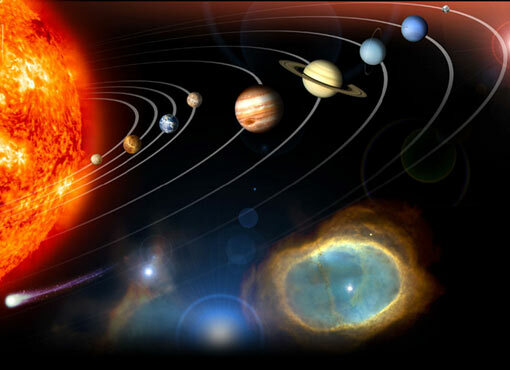 . .
what leaps to mind when you envision our solar system? There are but a few of the current scientific musings and discoveries. You can rethink more issues and topics if you like.